I love my chainsaw for the powerful tool that it is, but I also respect it. 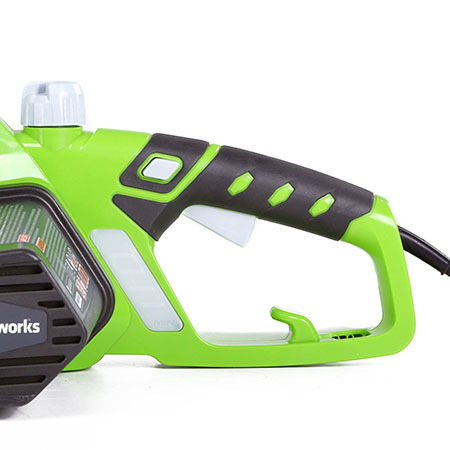 When used properly, a chainsaw can make your life a lot simpler. If you were to rewind the clock about 200 years the only tools available to you for chopping wood would have been a large axe, and while this got the job done it wasn’t easy. A job that today can be completed in 20 minutes would’ve probably taken you three or four hours. The point is, when you’re using a chainsaw take your time, because you’re already saving a lot of time by using this wonderful tool and rushing the job will only risk your safety. The chainsaws available in stores today have a lot of great safety features built into them. As you might suspect, the chain is the focus of most of the safety features, and in this article we’ll take a look at these built-in features that are designed to keep you safe from harm. Chainsaws these days really are a lot safer than they were in the past, but the key to your safety is still your own common sense. So it’s important not to assume that the safety features are 100% failsafe. When it comes to safety, you are the first line of defense. 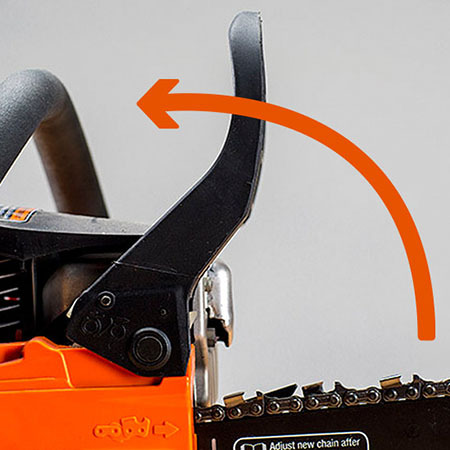 One of the simplest safety features on a chainsaw is the kickback guard. A chainsaw normally has two handles – one at the back that handles most of the weight as you can grip with your dominant hand and one at the front that you use for guidance. 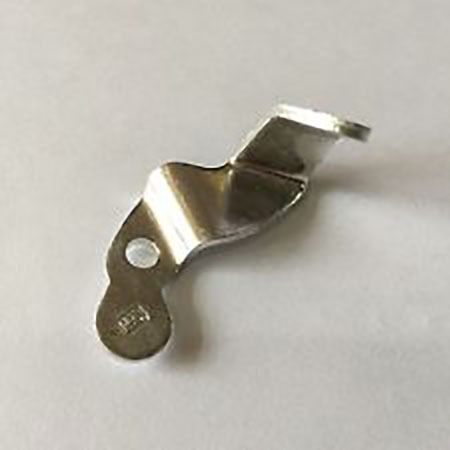 The kickback guard is placed between that front handle and the chain to protect you against the potential for the chain kicking back and cutting into your hand. That piece of plastic is an important piece of protection against serious injury, so if you ever find your operating a chainsaw with a broken kickback guard you should stop using it immediately. Another key safety feature built into almost all modern chainsaws is a chain brake. 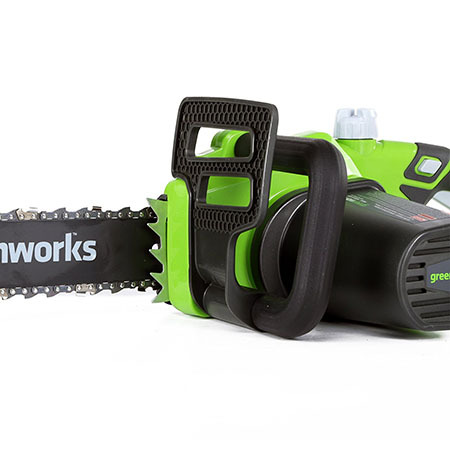 This is a unique feature that uses sensors that recognize when your chainsaw quickly reverses its motion. If this happens that sensor indicates to the chainsaw to shut itself off to prevent a kickback from causing serious injury to the operator. If you’re in the market to purchase a chainsaw and you come across a great deal, just make sure that it does include a chain brake feature. If it doesn’t include this feature, then that great deal isn’t really such a great deal. After all, your safety should always come first. The throttle lock is another line in your own personal defense against injury when operating a chainsaw. This feature is designed to prevent the throttle from advancing if you’ve taken pressure off the rear handle. As is the case with the chain brake, the throttle lock is designed to automatically engage when the throttle isn’t firmly pressed and accelerating in a forward motion. When a chainsaw kicks back that unnatural action will force you to take the pressure off the throttle and engage the throttle lock. It’s not a foolproof safety feature, but in most cases it does exactly what it is designed to do. The potential for the chainsaw to kick back because it’s come in contact with an uneven piece in the wood or some other obstruction isn’t the only concern you may face. On occasion, if your chainsaw is worn from consistent use, or simply comes in contact with something that damages the chain, the chain may break altogether. Almost all chainsaws also include a little feature called a chain catcher. This is located at the bottom of the chainsaw and is designed to do exactly what it sounds like it should – if your chain breaks it should get caught up in the chain catcher, preventing it from coming in contact with your skin and causing injury. Even when a chainsaw isn’t in use it can still present a danger – especially if you have small children. The teeth on a chainsaw are sharp by design; if they weren’t, they wouldn’t do a very good job of cutting wood. The problem is if you simply store your chainsaw in a high-traffic area in your garage somebody could accidentally fall on the blade, which will cause injury even if the blade’s not moving. 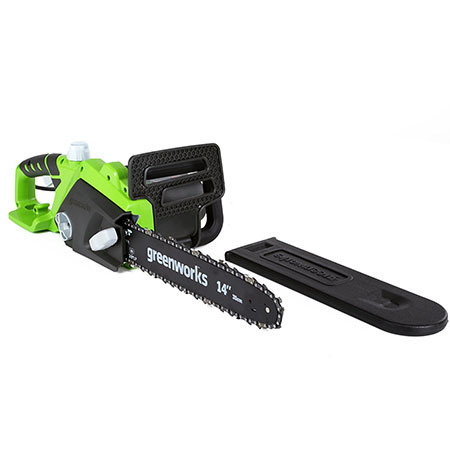 When you’re purchasing a chainsaw, consider looking for one that comes with a scabbard for the bar, which is a plastic cover that completely encases the bar and chain. If you put that scabbard on your chainsaw when it’s not being used it will considerably minimize the potential for injury from incidental contact. The features we’ve mentioned above are great tools to help prevent injury when using a chainsaw. There’s no doubt a chainsaw can be a dangerous piece of equipment if not used properly, but if you look for a saw with all of these safety features built-in, the risk of injury to yourself or anyone around you will be quite small. As we’ve already mentioned in this article, though, it’s up to you to always keep safety in the forefront of your mind and not just rely on built-in safety features to protect you. If you always remain safety conscious, and if you purchase a chainsaw with these safety features, it’s unlikely that you’ll ever have to worry about being injured by a chainsaw.